Four ewes and eight lambs tackle a growing problem at Furman's six-acre solar farm. 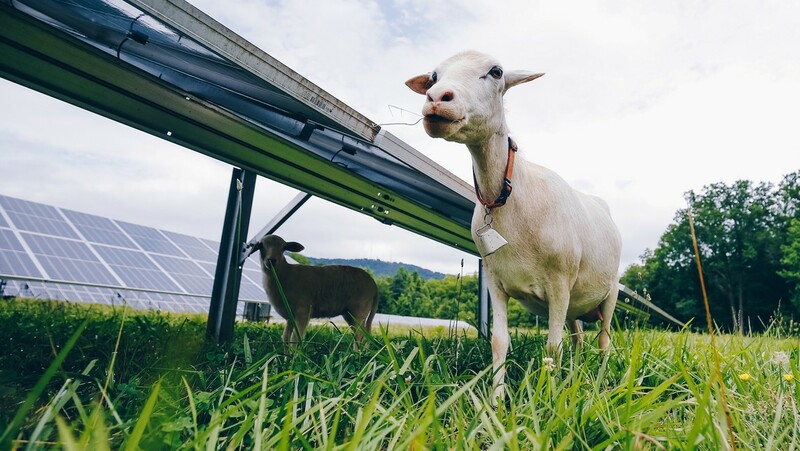 Local sheep farmer Steve Wood hesitated before coming to Furman with his idea of offering his sheep to help maintain hard-to-reach areas under solar panels at the university’s six-acre solar farm. In a piece by Greenville Journal’s Andrew Moore, Wood said, “I figured the university would think I was crazy.” But Furman’s Assistant Vice President of Facilities & Campus Services Jeff Redderson thought it was a great idea and approached Furman’s Shi Center with the possibility. Twelve sheep later, Furman is revamping the way it takes care of grass at the property. Last updated July 12, 2018 .